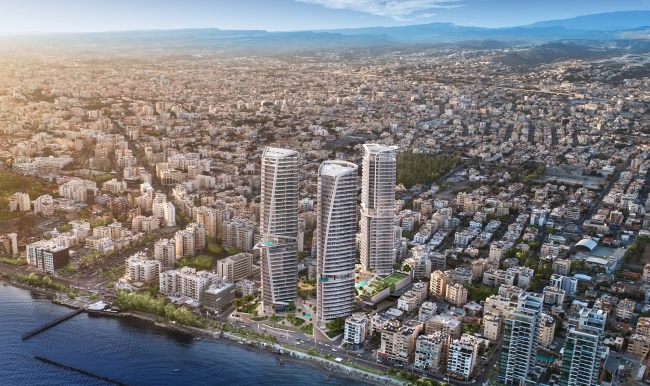 A further five high-rise towers are set to line the Limassol coast road; the ‘Trilogy’ project by Cybarco next to Enaerios and the ‘Blue Marine’ project by Leptos next to the Limassol marina. FIVE more high-rise towers are set to be built in Limassol, already home to several skyscrapers along the city’s coast road. The developments come in the form of two new projects. The first, by Cybarco, has been christened Trilogy and consists of three towers set to be built on a seafront plot next to Enaerios. Cybarco said all permits have been obtained and construction is set to begin in the new year. The completion date is expected to be 2023. The project entails the construction of three towers. The west tower which will be 39 levels, the east - with 36 levels and the north - with 37 levels. Meanwhile, the Blue Marine project, by Leptos, has received the nod from the environment department – under conditions – and is now awaiting a planning permit from the Limassol municipality. Set to be built next to the Limassol Marina, it entails four buildings. Two towers 29 and 33 floors and two buildings, five and nine floors each. The buildings will house luxury residences as well as indoor and outdoor swimming pools, a health and spa centre and eating facilities. Before a building permit is issued, the company must first prepare an environmental baseline survey and a disposal plan for underground water that may need to be drawn during construction. If approved by the environmental department, then a building permit can be granted for construction to move forward. Both new projects include the creation of more parking spots. Other high-profile buildings include One Residence on the sea-front, which will rise 170 metres and consist of 37 storeys, making it, according to developer Pafilia, the tallest residential sea-front tower in Europe. However, plans are also underway for the Lanitis Seafront that is to be built on the Lanitis mansion site where one of the towers will boast 37 floors. Leptos Estates’ meanwhile will build Limassol Del Mar which will not go as high as some of the other residential developments but will stretch across 170 metres of the sea frontage.